Scar is the main antagonist of The Lion King. His name before he got his scar was Taka. He is the younger brother of Mufasa and the uncle of Simba. 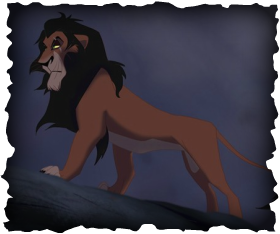 Scar is jealous of Simba's position as the next king of the Pride Lands, so he plots to kill his brother and nephew, in order to seize the throne. To carry out his plans, Scar recruits three spotted hyenas; Shenzi, Banzai and Ed — who gladly do his bidding in exchange for food. Mufasa foils their first attempt to kill Simba, so Scar calls up an entire army of hyenas and promises that when he is king the hyenas will "never go hungry again". With the help of the hyenas, Scar triggers a wildebeest stampede meant to kill both Simba and Mufasa. Mufasa manages to save his son, but as he tries to escape by climbing up the gorge, Scar throws Mufasa off the cliff back into the stampede to his death. Scar then convinces Simba that he caused the stampede (he had let out a loud yowl, while practicing roaring, seconds before the stampede began, and had not seen the hyenas chasing the herd into the gorge nor Scar throw his father to his death) and caused Mufasa's death. Scar advises Simba to run away then orders the hyenas to kill him, but they fail to do so. Scar then returns to Pride Rock and assumes the throne, letting the hyenas into the Pride Lands and leading the other lions to believe that both Mufasa and Simba died in the gorge. Scar's reign over Pride Rock is a disaster; droughts hit, food and water becomes scarce, and many animals die while others try to move on away from the Pride Lands, causing the kingdom to become a barren wasteland. He also grows increasingly paranoid about the loyalty of his subjects, becoming enraged upon the mere mention of the name "Mufasa". Years later, to Scar's surprise, Simba returns to challenge his uncle for the throne. After a verbal confrontation, Scar finally confesses to everyone that he actually killed Mufasa. A fierce battle erupts between Scar's hyenas and Simba's friends and family, while Simba fights Scar himself. Scar attempts to deflect Simba's anger towards the hyenas, not knowing that the hyenas can hear him, but Simba no longer trusts anything Scar says. After an intense duel, Simba manages to throw Scar over the cliff to the hyenas waiting below. The surviving hyenas, determined to get revenge on Scar for denouncing them as 'the enemy' on top of years of mistreatment, surround their fallen leader and maul him to death. 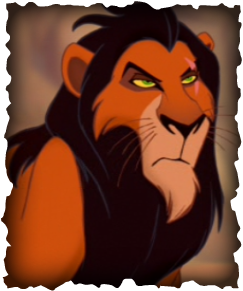 Scar is highly intelligent and charismatic, able to rally the hyenas to his cause and gain fanatical loyalty from Zira and her pride of lionesses. Scar is a Machiavellian individual who is mainly concerned with gaining power and will kill anyone he sees as competition. Despite his ruthless nature, he is a somewhat cowardly individual. He is more likely to run away from violence than confront it. When pressed though, he is portrayed as a fierce fighter who holds his own against Simba at the movie's climax. Due to him being able to plot the murder of his own brother and nephew and execute said plot without little remorse, it could be said that he doesn't care much for family relations, however, not much is known about the relationship he had with Zira or any offspring they may have had before he died. Scar is a sleek, elegant lion who is severely lacking in physical prowess, something he comments on himself and according to the synopsis. Scar's lead animator, Andreas Deja, intentionally designed him with a slick, combed back black silky mane and animated him to slither and glide rather than move about in the way the stockier, stronger lions in the movie do such as Mufasa or Simba. Scar's fur is reddish-brown, his mane is coal black,and his eyes are bright yellow-green, two trits he shares with Ahadi. He boast many features that resemble an Outsider. A scar, his namesake, runs across his left eye. According to the novel series, The Lion King: Six New Adventures, Scar's real name is Taka, which is Swahili for "dirt", "trash", or "want". In A Tale of Two Brothers, one of the books in the set, young adult Taka is angry that Mufasa is chosen to be the heir to the throne. He gets even angrier when his father, King Ahadi, breaks his promise to go hunting with him, choosing to solve the drought problems in the Pride Lands instead. Taka wanders off to talk to Shenzi, Banzai, and Ed the hyenas, who tell him that if Mufasa were to be made to look like a failure to their father, Ahadi, and the rest of their pride, then he, Taka, will look good in comparison and take the throne. Taka then tricks his brother into going down to the waterhole, where a cape buffalo named Boma is refusing to share the water. The Pridelands are in a terrible drought and any water there is precious. Mufasa begins reasoning with Boma, when Taka roars and says that Boma must move by order of the Lion King, or Mufasa will face Boma in combat. Boma charges out of the water at Mufasa. Mufasa escapes to safety with Rafiki, but Boma says that his herd will get Taka. Mufasa runs back to find Taka being attacked by Boma's herd. The largest of the buffaloes slashes Taka with his horns, knocking him unconscious. Mufasa leaps in to save his brother and the buffaloes ready themselves to attack again. Before they can do so, however, Ahadi appears with a large herd of animals. The herd surrounds the buffaloes and ends the fight. Later on, Rafiki examines Taka and finds a deep cut on his left eye, which will never fully heal. Taka then requests that he be called "Scar" from now on, as a reminder of how he foolishly allowed his anger to rule him..
Scar makes his first appearance directly after Simba's presentation, where he traps an unsuspecting field mouse under his paw, lifting it slowly and eyeing it thoughtfully. He points out to the mouse thoughtfully, more to himself, that life isn't fair, before beginning to lament on his own life and about how he'll never be the King. To make himself feel better however, he also tells the mouse he'll never see the light of another day, bidding it adieu, and lowering into his jaws to eat. Zazu interupts him however, asking rhetorically and mocking if his mother ever taught him not to play with his food. Scar responds with annoyance, trying to eat the bird when he points out mufasa won't be pleased with his absence. Just as he traps Zazu within his jaws, the King arrives, commanding Scar to release Zazu. Scar does, leaving the hornbill drenched in saliva, choosing to deal with his brother instead. He approaches Mufasa, carelessly invading his personal space in mock-surprise about being visited by his brother, but Mufasa moves onto more pressing matters. Scar says, again in a mock-surprised voice, he didn't know the Presentation was today and that he fell 'simply awful' for missing. Zazu points out, even as slippery as his mind is, he should've been first in line and Scar snaps his teeth at the bird, pointing out before Simba (referring to him as "hairball") was born he was first in line. Mufasa meets his brother's eyes, clearly stating that "hairball" is his son, the future king, and making it clear Scar was never gets the position. Scar says he'll practice his courtsey, turning his back and walking away from his brother. He veils a threat when Mufasa addresses him again, something that riles up the bigger lion. 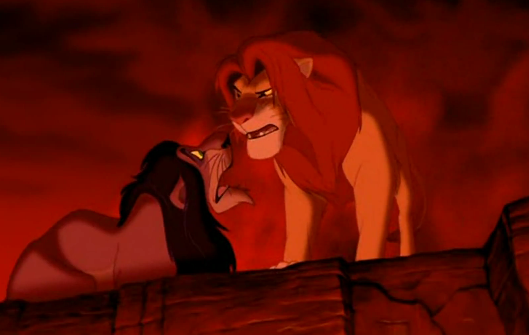 Scar reassures that he wouldn't challenge Mufasa, as he doesn't have the brawn to do it. He navigates around the two and strides off into the savannah. Later, after Simba is denied permission to accompany Mufasa and go take care of some hyenas, Scar is visited by his nephew. He reacts in seething anger and annoyance when Simba gleefully points out he'll be king, asking what that makes Scar. 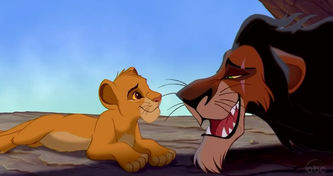 Scar replies "a monkey's uncle", but Simba simply laughs and calls his uncle weird. Scar takes interest in the cub's previous statement of being showed the whole kingdom, guessing Mufasa didn't show him what's beyond the northern border. He reaffirms that the King was right and 'lets it slip' that the Elephant Graveyard is no place for a prince. Scar shruggingly says Simba would've eventually found out and only requests Simba not go to the place or tell anyone where he heard about the Graveyard from. He pushes Simba off with a paw, knowing the cub's curiousity would eventually draw him there. His plan to kill Simba, via Shenzi, Banzai and Ed, is foiled by Mufasa when the lion comes to their rescue and fights the hyenas off. From attop a knoll, he watches in dismay as the cubs are led out of danger and his plan fails. For this, he scolds the hyenas, debating whether to feed them or not as he "practically gift wrapped the cubs for them" but for whatever reason, they still couldn't dispose of the two. He drops the zebra meat however, and though their noisy eating, Banzai points out something that gives Scar another idea: they'd kill the King and the prince in one full swoop. 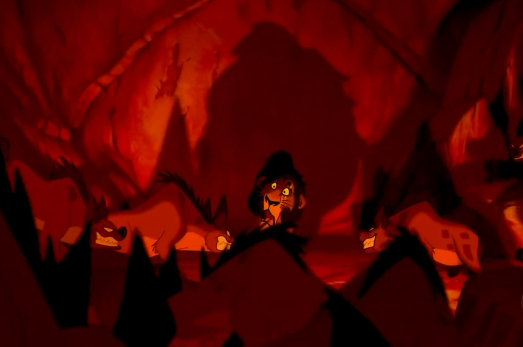 With a sinister "Precisely", Scar leads his hyenas army into the musical "Be Prepared" The next day, Scar lures Simba into the gorge and instructs him to wait on a rock for the "marvelous surprise" Mufasa has planned for him. Simba is extremely curious, opting to go with Scar, but the lion abruptly refuses his request. He brings up the incident with the hyenas, making Simba a little more compliant about staying on the rock, and suggest while he's there he work on his "roar". Scar begins to move off, when Simba addresses him again, asking if he'd like the surprise. The dark lion smirks, telling Simba that it is "to die for..."
From atop the gorge's walls, he gives the signal to the hyenas and they start up a thunderous stampede, comprised of hundreds of startled wildebeests. Scar finds Mufasa and in a staged panic, tells Mufasa about Simba's being trapped in the Wildebeest stampede. Both lions run off to The Gorge, spotting Simba clinging desperately to a weak branch. Mufasa jumps into the sea of hooves and Scar drops his act of panic, swatting the majordomo into the wall of the gorge rendering him unconscious. The dark lion slithers across the ridges of the gorge, never taking his eyes off of Mufasa's position. The King leaps into the gorge's walls, clinging there, but Scar meets him at the top. After taking time to drink in Mufasa's helpless form, he slams his claws into his brother's paws, sinisterly whispering "Long live the King", and then throwing Mufasa back into the gorge to his doom. 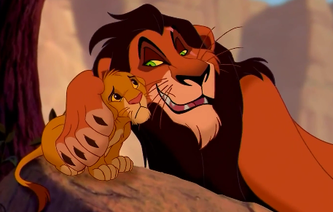 The newly labeled murderer meets Simba at the bottom of the gorge, seeing the cub curled up under Mufasa's broken body, and manipulates Simba, telling him that Mufasa's death was all his fault. He instructs Simba to run away and never return, siccing the hyenas on him as the cub disappears. To the pride he returns, telling them all the news of Mufasa and Simba's deaths, unknown to him that the prince was anything, but dead. After this, he introduces the hyenas and ascends Pride Rock to truly assume the throne. During Scar's reign, the kingdom becomes a drought which causes the lionesses refuse to hunt, knowing there is no food left. Even the hyenas, who are probably used to going hungry for days, start complaining to Scar about the larder being bare. Scar, however, picking his teeth with the bones of an animal from a previous meal presumably, tells them to get out when Banzai angers him by mentioning Mufasa, a name that has been banned by law to be spoken. Finally, Scar calls Sarabi to him, asking her why the hunting party refuses to do its job, not accepting Sarabi's excuse of their not being any food, merely passing their unsuccessful off as the lionesses not looking hard enough. When Sarabi suggest they leave Pride Rock, Scar makes it clear he isn't moving the pride anywhere, the former Queen angrily pointing out his decision would end up in the deaths of them all. Scar turns his back on her, telling her that he's fine with this result and that he is the King and can do whatever he wants. He angrily strikes Sarabi when she insinuates he isn't half the King Mufasa was, and this causes Simba, who was observing the entire scene, to spring from hiding in his mother's defense. Scar first mistakens him for Mufasa, but when it's made clear it the thought-dead Simba, he glares at the hyenas and cowers away as his nephew begins to back him into a corner. 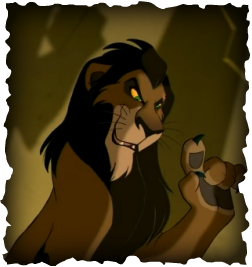 Scar makes it clear he isn't resigning, pointing to the many hyenas above him and telling him they think he is the King. However, Nala and the lionesses reject him, and Simba threatens he'll fight if his uncle doesn't step down. 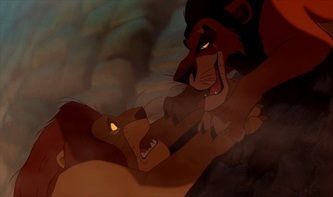 Scar slinks around Simba, hinting at Mufasa's death. The prince tells Scar his trick won't work, but the lionesses are curious as to what Scar is talking about. Pleasantly surprised, the King forces Simba to admit his responsiblity for Mufasa's death and proceeds to back Simba over the edge of Pride Rock's peak. As Simba slips off the peak, using his fore-paws to desperately cling for his life, Scar suddenly remembers Mufasa in similar situation years ago. Slamming his claws into Simba's paws just like he has previously done to Mufasa and assuming the youthful lion was as helpless as his brother was, Scar leans in and whisper to Simba that he, Scar, was really responsible for Mufasa's death. Enraged, Simba pins Scar, a paw pressing down on his throat. Scar tries to weasel his way out of the situation, but his nephew's choking him forces him to admit what really happened all those years ago. The hyenas ambush Simba, prompting the lionesses to rush in to fight off the hyenas, during which Scar slink away. Simba spots him however, and gives chase. 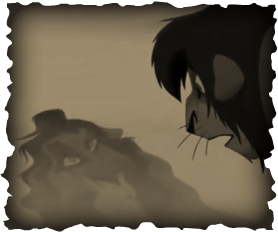 Trapped at Pride Rock's summit, Scar begs Simba for mercy as he places the blame on the hyenas, unaware they are listening, but Simba will have none of it. He asks Simba of his intentions, relieved when his nephew decides not to kill him, but he is horrified when Simba gives him his own advice to run away and never return. Scar begins to cooperate, but throws amber into Simba's eyes and tackles him while he is blinded. The two lions engage in a brutal fight, a hard smack from Scar sending Simba on his back. Scar leaps to deliver the final blow, but Simba uses his hind legs to flip Scar over the edge and send him tumbling down the cliff. Scar survives the fall, and as he struggles to his feet, he greets his hyena friends in a pleasing manner, but they hyenas make it clear they are no longer friends and begin to surround Scar, backing against the stone. Scar pleads with the hyenas to listen to him, but the hyenas have had enough with his treachery and broken promise, and they subsequently leap on him and tear him apart as the flame engulfs them all. Scar does not return as the villain in the direct-to-video sequel, The Lion King II: Simba's Pride, but it is revealed that Scar had a pride of lionesses loyal to him whom Simba exiled to the Outlands after he became king. They are led by Zira who is still fiercely loyal to him, who has three offspring: Nuka, Vitani, and Kovu. In the film, Zira attempts to use Kovu, who was briefly raised by Scar as well as his hand-chosen heir, to kill Simba and become king. Kovu, however, is not Scar's son but because of being chosen and raised by the lion still feels Scar is "a part of him", as he later explains to Kiara, Simba and Nala's daughter, and Kovu's presumed mate. Scar only appears twice, the first time in Simba's nightmare. In the nightmare, Mufasa clings to the cliff above the stampede as in the first film, and Simba tries to reach down to help his father. However, Scar appears on the ledge and grabs Simba's paw, preventing him from reaching Mufasa. Scar laughs, suggesting Simba trust him and let Mufasa fall. Mufasa falls into the stampede and the cackling Scar morphs into Kovu. Kovu flashes an evil grin and throws Simba into the stampede, as Scar had done to Mufasa in the first film. He appears again when Simba banishes Kovu from the Pridelands. As Kovu looks into a stream as he is exiled, he sees Scar's reflection rather than his own. Given that Kovu had rejected defending his legacy, the young lion flees the vision in panic. 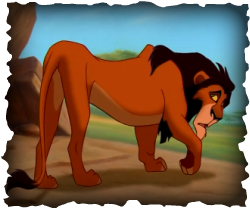 In the direct-to-video "parallel film" The Lion King 1½ (2004), Scar makes a few brief, non-speaking appearances in the scenes for which he was present in the original Lion King film. 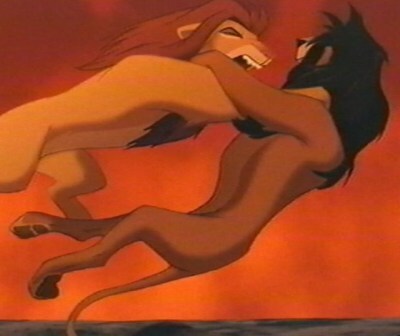 He is shown making Simba fall over Pride Rock's peak and fleeing from Simba after admiting he murdered Mufasa. Finally, after Timon, Ma, Pumbaa, and Uncle Max defeat the hyenas, Simba kicks him over the side of Pride Rock's summit, into the hole the hyenas fell into, and to his death.